Pittsburgh Steelers wide receiver Emmanuel Sanders (88) misses a pass as he is covered by Cleveland Browns defensive back Buster Skrine (22) in the first quarter at Heinz Field. PITTSBURGH (AP) — Pittsburgh played like it didn’t want its season to end. Cleveland looked like it couldn’t wait to pack things up and go home. The Browns got their wish. The Steelers might, too. Le’Veon Bell ran for 90 yards and a touchdown and Pittsburgh maintained its unlikely pursuit of a playoff berth, drubbing the lifeless Browns 20-7 on Sunday. If San Diego loses to Kansas City after both Baltimore and Miami lost Sunday, the Steelers sneak in. Yes, the same team that was 2-6 and looked like it needed a franchise-wide makeover a few days after Halloween is one of the final two standing for the last AFC playoff spot. "We’re still hanging on," quarterback Ben Roethlisberger said. 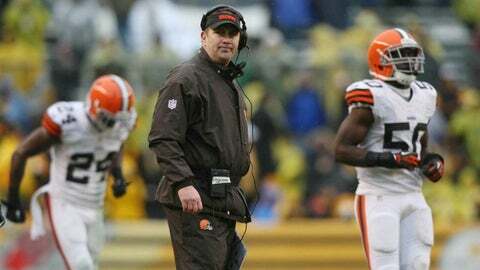 So too, perhaps, is Cleveland coach Rob Chudzinski, just in a different way. The Browns (4-12) lost their final seven games and went just 1-10 since early October. Not exactly the step forward new owner Jimmy Haslam was looking for with a roster littered with five Pro Bowlers. The team declined comment on reports Chudzinski is in trouble, though Chudzinski’s players did something after the game they failed to do during it: rally around their coach. "It’s just absurd to me that a report would be out like that, about a good coach like that," Browns linebacker D’Qwell Jackson said. "It’s crazy, and that (ticked) me off when I heard that." Cleveland didn’t exactly play angry while letting the Steelers roll to victory for the 26th time in 31 meetings since the Browns were revived in 1999. Roethlisberger passed for 179 yards and a touchdown against two interceptions as Pittsburgh (8-8) won its third straight to avoid the franchise’s first losing season since 2003. The victory also continued a furious second-half rally by the Steelers, who went 6-2 over the season’s final eight weeks to fuel an improbable run at the AFC’s final postseason spot. "Guys just kept fighting," Steelers defensive end Cam Heyward said. "Wasn’t anything glorious or something beautiful, we just came out of nowhere." Jason Campbell completed 23 of 41 passes for 240 yards with a touchdown and an interception. Josh Gordon caught seven passes for 82 yards to finish with an NFL-high 1,646 yards receiving, a first for the franchise. It proved little solace on a wet, miserable day at Heinz Field in which Cleveland looked very much like the same old Browns. Cleveland was largely noncompetitive over the season’s final three months, losing 10 of 11, with seven losses by a touchdown or more, including two to the Steelers by a combined 47-18. Chudzinski called it simply "a difficult day," and added there has been no discussion with the front office about his job status. There is no sense of panic in Pittsburgh. A season that appeared teetering on embarrassment after a 55-31 loss to New England on Nov. 3 ended up with a decidedly rosier finish. The Steelers scored on the opening drive, a 9-yard strike from Roethlisberger to Jerricho Cotchery, and it was more than enough. Whenever the Browns threatened, they found a way to botch it. Twice they failed on fourth-down attempts in Pittsburgh territory and didn’t reach the end zone until Campbell found Fozzy Whitaker on a 35-yard pass with 2:46 remaining. By then most of the attention had turned to the scoreboard, where the biggest roars were saved for scores by the Bengals and Jets, who then won to boost Pittsburgh’s playoff chances. The rapid development of Bell helped Pittsburgh’s remarkable turnaround. He broke Hall of Famer Franco Harris’ team record for total yards from scrimmage by a rookie by combining for 96 yards in the muck at Heinz Field. Bell finished with 1,259 total yards in just 13 games, 24 more than the mark of 1,235 Harris set in 1972. Bell’s 5-yard touchdown burst in the second quarter, which included a nifty spin move in the backfield, gave the Steelers a 14-0 lead at the break. It capped an 87-yard drive in which Bell touched the ball 10 times in 14 plays. That was more than enough for a defense that appeared rejuvenated, sacking Campbell three times, including a strip fumble by defensive end Brett Keisel, likely playing his final regular-season game of his 12-year career with Pittsburgh. The hope for at least one more playoff game remains, at least for a couple of hours. "It’s amazing that last week things kind of fell into place," Keisel said. "We’re kind of hoping the same thing this week." NOTES: Steelers WR Antonio Brown caught nine passes for 97 yards to finish with 110 receptions on the season, narrowly missing the club mark of 112 set by Hines Ward in 2012. … Roethlisberger finished with 4,261 yards passing, the second-highest total in team history to his 4,328 in 2009.